Rapid lysis of target cells by complement requires the presence of all five terminal complement components C5b, C6, C7, C8 and C9. 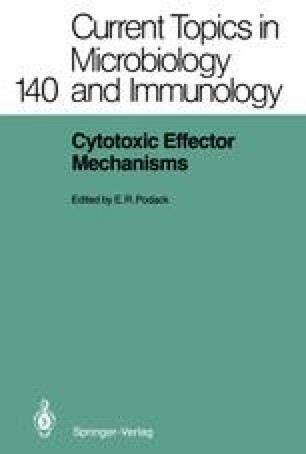 Although early studies using aged sheep erythrocytes as a target cell suggested a minor role for C9 in this process (Stolfi 1968; Hadding and Müller-Eberhard 1969), the prevailing view now is that the formation of stable cytolytic complexes in fresh erythrocytes or bacteria absolutely requires the presence of C9. There is still, however, considerable debate about the molecular structure of the lytic complex and the actual cause of cell death. Morphological (Humphrey and Dourmashkin 1969; Bhakdi and Tranum-Jensen 1978) and biochemical (Bhakdi and Tranum-Jensen 1984) studies have shown that hollow cylindrical pore structures (membrane attack complexes, or MACs) containing a large amount of C9 relative to the other terminal complement components form on the surface of target cells. Since C9 can be induced to polymerise in vitro to form cylindrical structures with similar dimensions (Tschopp et al. 1982 a), a natural conclusion is that complement lysis is caused by the ability of C9 to insert and polymerise within the bilayer to form hollow pore complexes. An alternative to the pore model postulates that C9 causes lysis by a detergent-like disruption of the lipid bilayer (Esser et al. 1979). The morphologically observed lesions on this model are regarded as non-cytolytic byproducts of C9 insertion into the membrane (Dankert and Esser 1985).